World War lll is not around the corner, it is not coming next week, or next month, it’s happening now. Too many people who are used to wars involving one or more countries fighting other countries, it is something in the future because they cannot grasp the fact that we are involved in a war without borders, where the soldiers are not easily identifiable by the uniform they wear. World War lll is a religious war and it has already started. The murder of Christians around the globe is an indicator of what is to come unless the march of Islam is stopped in it’s tracks. A simple Google search tells us that Christianity is the world’s largest religion, it has more ‘members’ than any other. However, that’s a little misleading. The most practiced religion, the religion where people believe and adhere to the teachings of that religion is Islam, and that is where the problems begin. We hear the word jihad daily, but we often don’t understand what we are hearing. The Qur’an talks of two jihads, the Lesser and the Greater Jihad and this is where we fail to understand the motivation behind extremist views. The Greater jihad is the everyday struggle that Muslims face to grow in their faith and worship Allah, something most Muslims feel is the hardest thing they are asked to do, hence the greater tag. The Lesser Jihad is the struggle they face to build a good, stable Muslim society. It is the Lesser Jihad that allows Muslims to conduct Harb al-Muqadis, holy war. Allow Muslims to practice their faith. To protect Muslims against attack. To put right something Muslims perceive as a wrong. Poisoning of wells is forbidden (chemical or biological warfare might be a modern analogy). A non-military Jihad, one conducted by, for example, an unofficial group of extremists is not governed by these rules, and that’s why we see the atrocities from organized but unofficial groups such al Shabab, al Qaeda, Boko Haram and so on. Just as Christianity encompasses various different groups, Roman Catholic, Baptist, and Pentecostal for example, then Islam also has different sects within it. Sunni, Shi’ite, Alawite and Wahabi are some examples. They all believe in Allah, they all follow the teaching of the Qur’an but their interpretation of it is different. It is these differences that is stoking the fires of civil war in Iraq. This was bound to happen. When you remove a leader, however bad you feel he is, and then you remove the force that removed that leader, there is a vacuum left behind that rival factions will attempt to fill, and this is precisely what’s happening in Iraq, and what will happen across the rest of the Middle East, and Africa until the winning sect takes on the rest of the world. Abdullah Al Araby, the author quoted below is an American and a Christian. The Islamic Review covers aspects of Islam that are not usually brought up in public, especially by Muslims. The site is well worth a visit if you want to know more about how Islam intends to conquer the world, including marrying western women, notably American women in order to gain a foothold across the United States. 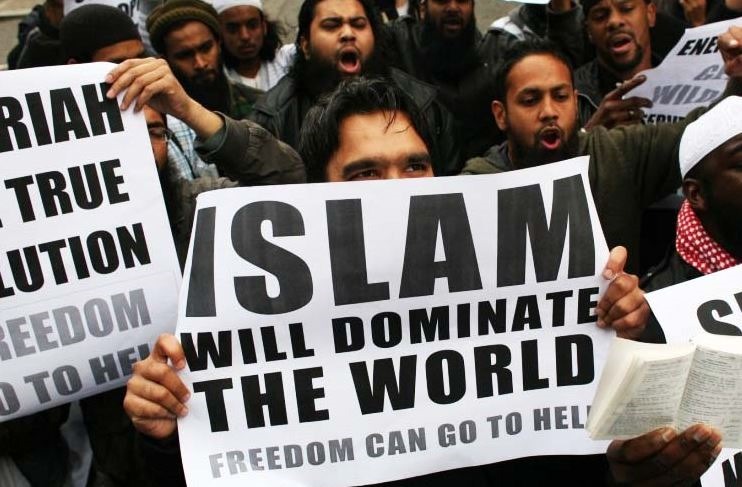 Islam’s ultimate goal is to rule the world. Islamic theology provides two methods for this to be accomplished. The first is spiritual, as people are lured into conversion. The second is coercive; it is the political/physical conquest of nations. For Muslims, there are no gray areas. They see the world in black and white. To them the world is divided into two big camps: the House of Islam and the House of War. The House of Islam are the Muslims, and the House of war are the non-Muslims. Muslims (the House of Islam) are in a constant state of spiritual/political/physical warfare with Non-Muslims (the House of War) until they subjugate them into Islam. Islam always employs a carrot and stick policy. The carrot and stick that is perpetually set before Muslims is the expectation of generous rewards in this life and in eternity for those who fight for Islam. On the other hand, those who falter are warned of severe temporal and eternal punishments. Apostasy from Islam is not an option. Once-a-Muslim-always-a-Muslim, the only official alternative is death. There is no room for changing one’s mind. The door is wide open to join Islam, but there is no backdoor for those that would like to leave it. The third point there is important. A person is considered in Islam to have the religion of the father. Barack Obama, even if he doesn’t wish to be, is considered under the law of Islam to be a Muslim. As no attempts have been made on his life one has to assume that Islam regards him as still being a Muslim, that he has not turned his back on the faith. Releasing five high value Taliban commanders in return for one American soldier has possibly reinforced this opinion to many at home and to Muslims around the world. More seriously, large sums of oil monies are covertly slipped into the hands of Muslim extremists’ organizations. Without any qualms of conscience they finance terrorist attacks, against non-Muslims and against moderate Muslims alike, around the globe. With these factors in mind, it should be no surprise that Islam is growing in the West. In addition, unquestionably the Muslim activists of modern times are smarter and are using more sophisticated tactics than those of ancient times. The days of the primitive methods that were used to conquer the known world, between the 7th – 17th centuries, are over. Islam now applies carefully studied and sophisticatedly executed methods. They define their targets, and decide on the best strategies to reach them. Young women are reached through love and marriage. With our African-American citizens the race card is used. They are deceived into believing that Mohammed was black and that Islam was birthed on the African continent. To the needy, they use money. For most people, they polish Islam and present it in an attractively revised westernized form. The violent Quranic verses that were revealed in Medina are carefully excluded. The peaceful verses of the Mecca era are emphasized. The fact is, according to Islamic theology, the early peaceful verses that were written in Mecca are nullified (abrogated), and replaced by the later verses that were written in Medina. To the religious establishment they claim compatibility with the Judeo-Christian faith. They cite belief in Moses, Jesus, and the Virgin Mary. They concur with us on the existence of Heaven and Hell. Regardless of their boast that they have a lot in common with us, the fine print in Islamic teaching tells a different story. Legally and politically they have the means to buy political influence and to retain high-powered teams of skilled lawyers. These experts find loopholes in our laws that enable Muslims to manipulate the system. They frighten their opponents with the prospect of dragging them into long-term court battles in order to sue for large sums of money. Make no mistake about it; Islam is well on the road to becoming a major spiritual/political influence in the New World. It is imperative that we don’t lose sight of the fact that their ultimate goal is to rule the world. It is patient enough, and sufficiently financed, to accomplish its goal, one country at a time. Muslim advocates are working fervently to convert America to Islam. Their dream may not be practical, but they are gaining ground every day. There is a thought that often wakes me at night: The Muslims were able to conquer most of the known world in the 7th century with their limited and primitive means. What will happen to the world, if America becomes a Muslim country, and its might, wealth, technology, and resources fall into the hands of the Muslims? If this occurs, the New World will look like the old world. Time will lapse, and revert back to the 7th century, and the New World’s civilization will be reduced to a big, barren Sahara desert. We, The West, need to stay away from these conflicts. While there is a chance of winning on our own soil, there is no chance on theirs because the rules of engagement are so very different. The difference between a professional soldier and a Jihadist comes down to one main issue. The soldier wishes to remain alive, the Jihadist wishes to die for Allah. To beat an enemy whose prime directive is not to remain alive, but to martyr himself for his God, is not something that can be dealt with just by using a gun. Muslims killing Muslims is reducing the numbers of those who follow Islam, a harsh reality, but it’s true. I feel for the innocents, for the children who are caught up in the violence but sadly in war, even innocent lives are lost. It should be remembered that these are Muslim fighters, warriors for Islam killing Muslim children, and given half a chance they will kill American children, and old people and young people and anyone else they see as standing in their way. The only way that Christianity can survive, that our way of life can survive, is by preventing Islam getting a foothold on our home soil. Protecting our borders from infiltration by radical Islam has to be the number one priority of the politicians. If the Middle East wants to destroy itself so be it, it is their business not ours. The United States government needs to concentrate less on controlling law abiding Americans and more on finding, isolating and returning to their own countries those who wish to destroy the fabric of American society. If in doubt…kick ‘em out are the words that come into my mind. The opinion accepted by most Muslim theologians, is that it’s unacceptable for a Muslim to continue residing among the infidels unless there is a benefit to Muslims from it. They cite an evidence for it when Al Abbas decided to stay in Mecca among the polyesters even after Mohammed and his companions decided to immigrate to Medina. The reason was that Al Abbas wanted to stay in Mecca to inform Mohammed of what is taking place there. In other words, he was acting as a spy for Mohammed. Other than that, it is not preferred that a Muslim continues living among infidels for fear he may be influenced by their way of life and may imitate them. Islam is not just a religion, it’s a state to which all Muslims belong regardless of where they live. It is a set of laws, directives laid down from which there is no option of escape. There can by definition be no such thing as a moderate Muslim. He/she is ORDERED by the Qur’an to spread Islam around the world, to create one Islamic state. I asked a ‘moderate Muslim’ friend where his real allegiance lies, The United Kingdom which is the country of his birth or with Islam and what he would do if called to jihad, would he kill me if I stood in the way of his beliefs? He left the hospital less than 24 hours after this witnessed conversation, good job if I am honest, he would have probably needed medical help if he had stayed…lots of people were very upset. I was stunned he would sit in a staff coffee room and come out with this, but he did, without hesitation. Someone I had known for years, I was totally stunned. The takeover by Islam has already begun.